The Paradox of Watchmaking: Shouldn't Watches get Cheaper with Efficiency? The reminder function is a cunning complication, cleverly blended into the rendezvous theme. Case height of 10.6mm might bother some ladies, though most would find it ok. The Rendez-Vous Collection from Jaeger LeCoultre focuses on making traditional watchmaking available to the feminine watch lover. The series feature very beautiful and feminine watches to be sure, but always with a high mech touch to highlight the brand’s haute horlogerie origins. For SIHH 2017, the collection extends to feature a rather unique complication in a ladies watch – in line with the rendezvous theme: this is the review of the Jaeger LeCoultre Rendez-Vous Sonatina. Available in pink gold and in white gold with a very charming purple dial. Please read our Jaeger LeCoultre SIHH Press Release coverage for the basics of JLC’s Rendez-Vous novelties this year. Two versions are offered by Jaeger LeCoultre. 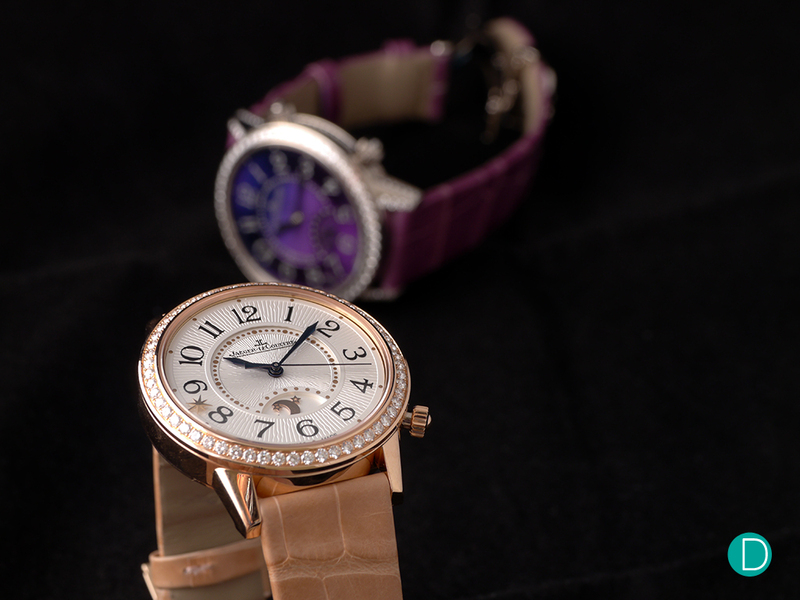 A yellow gold edition with a silvered guilloche dial, and an edition in white gold with a guilloche purple dial. The white gold version carries more diamonds on the bezel and the lugs, and thus priced higher than the white gold version with diamonds on the bezel only. The Rendez-Vous collection was started by Jaeger LeCoultre in 2012. The maison had in mind a ladies collection which bear all the traditional hallmarks of Jaeger‑LeCoultre’s Métiers Rares™ (Rare Crafts). The series was to have impeccable timekeeping accuracy, coupled with an un-rivalled excellence in craftsmanship and the breathtaking artistry of its jewellery designs and settings. We covered some of the magnificent Rendez-Vous watches here. Click here for the Rendez-Vous Minute Repeater launched in Watches & Wonders 2014, and the Rendez-Vous Moon and Rendez-Vous Celestial announced also in 2015. This year, they added the Sonatina. The Rendez-Vous Sonatina is an elegant watch featuring a special alarm. Instead of the ringing of the Memovox to remind one of an appointment, the Sonatina features one with a delicate single strike. A melodious tone emerges at the appointed time to remind one of one’s impending rendezvous. We like the idea tie-in between the collection name and this complication. and we also loved the visual design of the watch. The Rendez-Vous Sonatina was one of the watches which won the Chief Editor’s Choice for SIHH 2017. The watches are cased in what JLC calls the Rendez-Vous Large case, measuring 38.5mm in diameter, and a rather thick 10.59mm height. While the case diameter is rather updated for the modern woman, some might find the watch a bit thick. However, the case’s round shape with elegant lugs are very well proportioned and the visual aesthetic is one which is rather feminine. Also, the case needs to be that height to house the movement with the alarm. 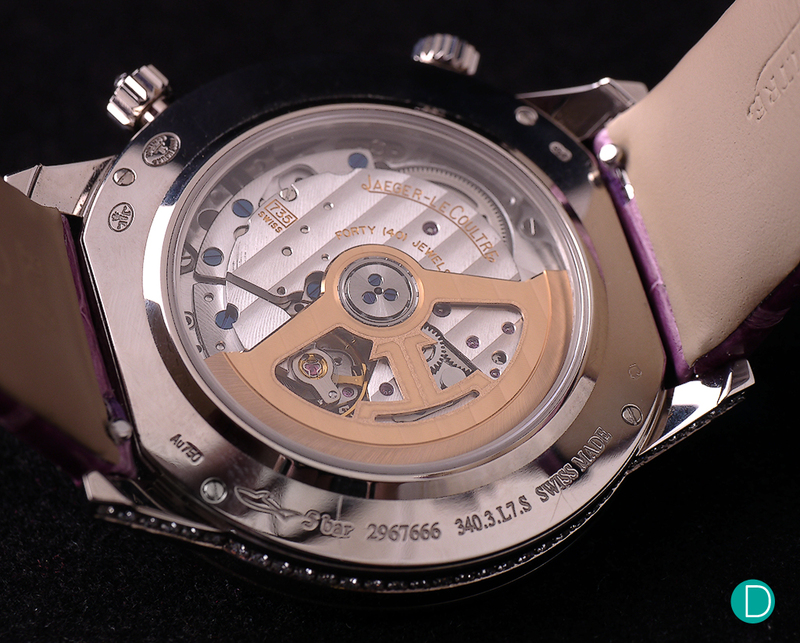 The movement itself measures 5.57mm high. The 38.5mm white gold case on the sonatina has its bezel and lugs with diamonds, totalling 1.95 carats. The dials are decorated with guilloché, made by hand with a rose engine. The white gold version features a purple/amethyst dial which shows a beautiful range of colours ranging from blue to purple as light strikes it at various angles. The dial is very beautiful to look at. The Arabic numerals on the dial are white frosted, and appears to have good contrast with the purple hue. The pink gold version offers a more sober take. The dial is also made with a guilloché, but with a different pattern from her white gold cousin. And the Arabic numerals are printed in black. 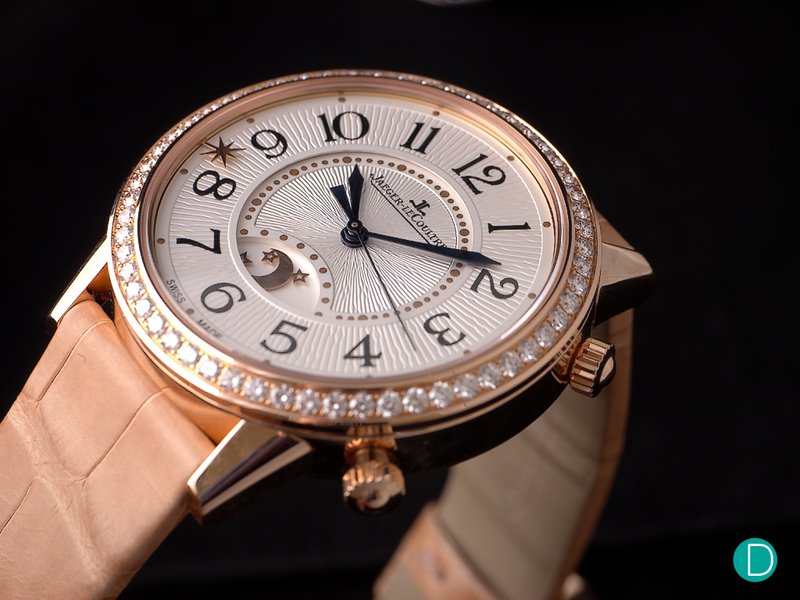 The dial also carries a star, which is moved around the dial by the second crown to mark the time of the appointment. At the appointed time, the watch releases a delicate strike to remind the owner of her rendezvous. In yellow gold, the watch is more sober, with a silvered guilloche dial, and featuring a few less diamonds than the pink gold version. The white gold edition’s diamonds are only on the bezel, and total 1.33 carats. A small aperture at about 6 o’clock on the dial offers an indication of either night or day by showing the motif of either a moon or sun which is an appliqué in gold. As mentioned in the picture captions, the white gold version carries diamonds on the bezel and lugs, while the pink gold version is more modest in that the diamonds only cover the bezel. The movement used in the Sonatina is the in-house designed and manufactured JLC C.735 which carries a day/night indication and an alarm. Alarm watches are a forte of JLC, having cut their teeth in various Memovox editions in their rich history. The C.735 uses the same working principle as an alarm watch, but instead of sounding off a ringing or buzzing tone, it lets off a single strike on a gong. The major difference is that it requires less power to operate than a regular ringing alarm, but the gong needs to be tuned in a similar fashion as a minute repeater to make the exquisite single strike note. The Jaeger LeCoultre C.735 beats in both the versions, with functions of time indication, day/knight indicator as well as the alarm which strikes a delicate note to remind the owner of her pending appointment. The movement is finished in a typical JLC fashion, which means that it is well finished as required of a haute horologie movement. We do note that as is typical of JLC movements, the finissage tends to lean on the practical and engineering school of finishing, rather than a fully decorative, dazzling one. Anglage, fauss côtes, polishing, bevelling, chamfering are all adequately covered. And the movement aesthetic is very pleasant. The automatic winding movement offers a power reserve of 40 hours, beating at 28,800 bph. The Sonatina is a useful complication. A discrete strike at the appointed time. Delicate, yet clear and unmistakable. The note struck is pleasant to the ear, and very fitting to both the feminine theme as well as the notion of a rendezvous. The watch design is well balanced, looking beautiful. And the choice of the pink gold for the more discrete look, or the white gold for some added colour is indeed quite nice. 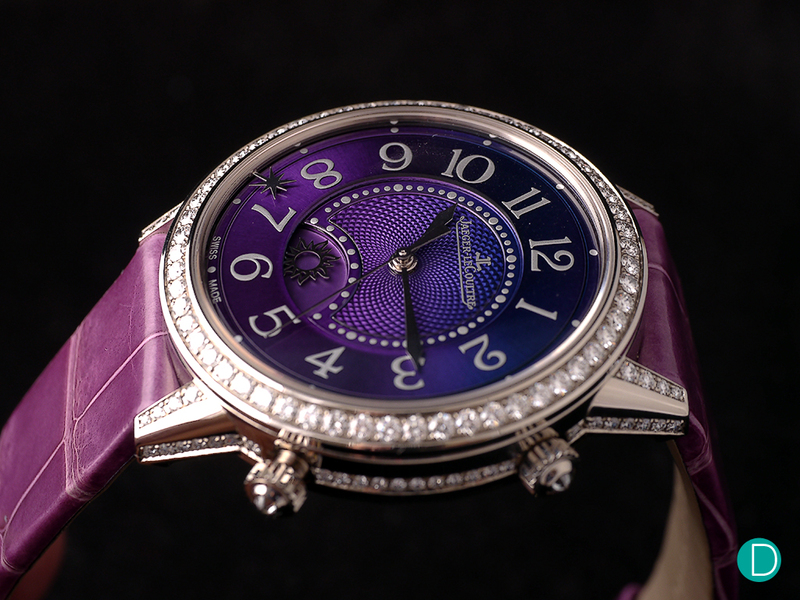 We are particularly impressed with the tonal variations achieved by the beautiful purple/amethyst dial. Magnificent. We like this approach taken by Jaeger LeCoultre. Mixing the elegant, feminine with a robust, haute horlogie movement with a complication. And priced at S$ 42,500 for the pink gold and S$ 59.500 for the white gold version, we are persuaded that this represents reasonable value, given the beautiful design, the thoughtful complication, and the high mech movement. 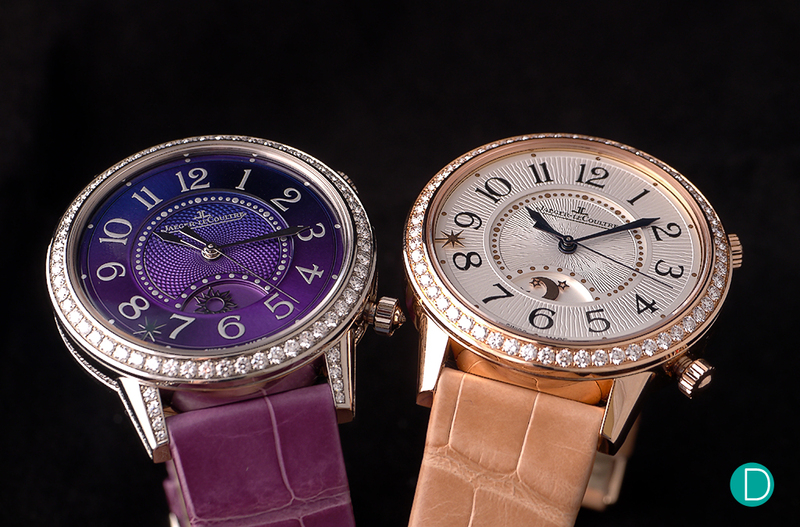 The Jaeger LeCoultre Rendez-Vous Sonatina, on the left in white gold, and on the right in pink gold.